Quickly create events in your Google Calendar by typing the description in natural language. This application allows users create new events to a Google calendar* of your choice by typing the content, date and time, duration, and location of the event in natural language. This application uses the Google OAuth authentication, your username and password are not stored anywhere on your computer. 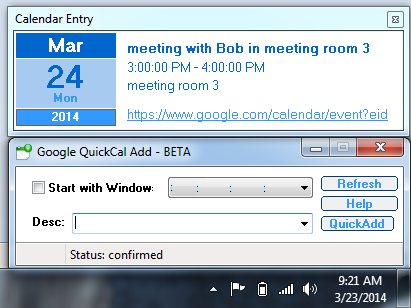 Once you allow this application to have access to your calendar, you can create events in your calendars directly from the Windows application, without having to open a web browser every time. As a new time-saving feature in v1.1, you can now select text from any application or webpage and use that information to create a new Quick Add entry by pressing the "Control+g" keys. The application will display Google’s interpretation of your request for verification. Ity also includes a direct link to the created event, in case you need to edit it. 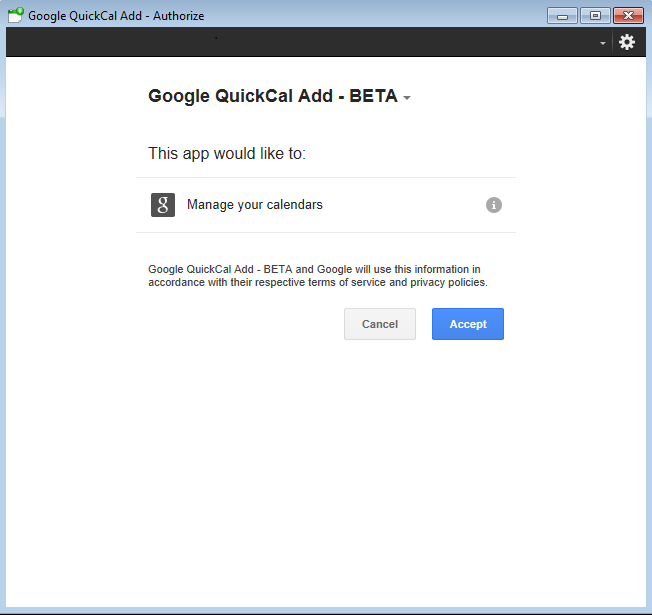 This application also solves the biggest complaint about the Google Calendar Quick Add feature by allowing users to select which calendar they want the event to be added to. This is a small "Green" (and portable) Windows utility. It does not make any changes to your system or your registry...and at a size of 729Kb, it won't fill your drive! Requirements: Windows 7/Windows 10/Windows Vista/Windows XP/Windows 2013/Windows 2008/Windows 2000. Please note: The use of this software is subject to quotas imposed by Google, and subject to be discontinued at any time without notice. After you run the program, all you will see is the application window on the right-hand side of your Taskbar. The main interface is extremely simple. Checking the “Start with Windows” checkbox will allow this application to auto-start every time you start your computer. Unchecking the checkbox will disable this feature. You must first click the “Refresh” button in order to populate the list of calendars. The FIRST time you do this, you will be asked to authenticate to Google and allow this application to have access to your Google Calendars. Please follow the requested steps. The drop-down will then be populated with the list of the Google Calendars that are linked with the account you selected. Please note that the calendars you only have READ access to will not appear in the list. Make sure to select the calendar you want to add the entry to. Type-in the description of the event in natural language (please follow Google’s recommendations), and click the “QuickAdd” button to create the event in your calendar. The status of your request will appear in the status bar on the bottom of the main window. A verification window will also appear to display the Google’s interpretation of your request. A direct link to this event is available on the bottom of the verification window in case you need to edit and modify the event. Copyright © 2015 Mount White Technology Solutions, All rights reserved.